When launching the X-Class,Mercedes-Benz promised a V6 version would be available – and now that promise has been delivered. The 3.0 litre, 258hp (190 kW) six-cylinder is widely used across the Mercedes-Benz product range, and is a well-provenunit. Externally the V6 model is similar to the regular version apart from the X 350 d 4MATIC badging on the rear tailgate and the V6 Turbo emblem on the front wings. The X 350 d shares the same ladder frame chassis and bodywork as its smaller powered sibling. The V6 delivers the 550 Nm of torque over a wide band stretching from 1400 to 3200 rpm. The torque is transferred to the permanent all-wheel drive through Daimler’s 7G-Tronic Plus automatic transmission in a 40/60 split. A Dynamic Select control offers a choice of four driving modes, Comfort, Eco, Sport, and Manual with shift-paddles on the steering wheel. 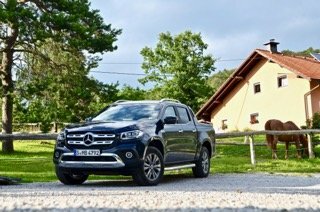 In off-road mode it is possible to switch between High and Low range while moving, and when combined with the diff-lock and Hill Descent it makes Mercedes-Benz X-Class a more than competent off-roader. On the tarmac, independent front and five link rear suspension produces a stable and car-like ride. The V6 X-Class is exceptionally quiet to drive and the 7G-Tronic transmission works well with the V6 to deliver passenger car performance figures such as 0-100 km/h in 7.5 seconds, and a top speed of 205 km/h. These figures are normally of little relevance in this segment, though they do indicate what the X-Class V6 is capable of. X-Class comes well equipped with important safety features as standard. In addition, its approach, departure and break-over angles are all more than respectable for this class of Pick-up. In Ireland, X-Class 350d 4MATIC will be available in either Power or Performance trim levels when it arrives here later this year.